On February third in the church in front of the Parroquia, you can receive a special blessing on your throat to protect you from colds and flus. 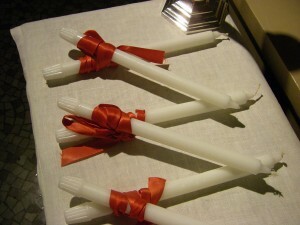 The blessing of the throat is performed with two consecrated candles held in a cross and pressed to your throat in honor of Saint Blaise (Blas in Spanish, a common town name). Saint Blaise lived in the fourth century’s Armenia. Once, a distraught mother whose child was choking on a fishbone, was cured by Blaise. Consequently, Saint Blaise is invoked for protection against injuries and illnesses of the throat. Ironically for the patron saint of throats, Saint Blaise was beheaded in 316 and February 3 is his feast day.